We've been working hard to add amazing new features that give you even more bang for your buck! A lot of them have been suggestions that you have made, so thank you for all the feedback and helping us to make DonorSnap better every day. This is a big one. Send an email to your entire database or to a targeted email list. Simply build your email list in DataMiner Platinum, write your email, and click send! This tool was built to supplement any existing email marketing system that you are currently using. It gives you the ability to write emails like you would in your regular email client, but send them to everyone with personalized content. Not only can you send mass emails, but you can also track them. Learn who is opening your emails, clicking on your emails, or is not taking any action at all. Every database receives access to this tool, but you may need to enable it for your user in order to see it. Each month you can send up to twice as many emails as your subscription contact limit. Learn more by watching the Mass Email Campaigns Training. 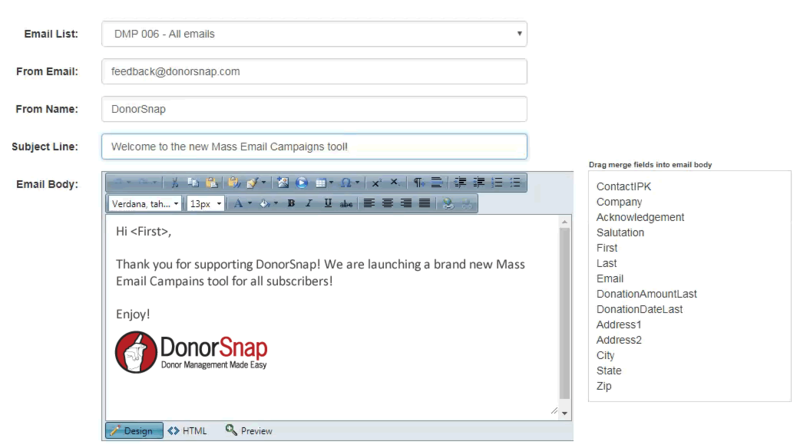 DonorSnap has already been able to import large amounts of new data from spreadsheets into your database. This latest update has added functionality for updating any type of existing record in your database, including donations! Data cleanup will now be a breeze using Excel Update. Let's say you entered a batch of 200 donations and forgot to include a payment method. Now you can export those donation records along with the DonationIPK (the unique ID number) to Excel, quickly add the payment method for the whole spreadsheet, and then import those changes back into DonorSnap. The new and improved Contact Merge tool now makes it easy to combine contact information between two contact records. The old tool only moved the activity records from one contact to another, but it left the actual changes in the contact record up to your manual entry. Those days are long gone with the new interface. DonorSnap will automatically detect the differences between the two contact records and let you choose which field you would like to keep. Give me all the people that have donated this year within a 20 mile radius of my zip code. Excited? That's exactly what this latest addition does. Use DataMiner Platinum to build proximity reports where you specify a zip code and the distance you would like to search. You'll see this new feature in the Query Builder tab when you add a field line for "Zip/Postal Code" and select "Proximity" as the operator. See an example proximity query. This one is a small change, but it might change your life! Ok, that might be a bit of an exaggeration, but it could save you a lot of time. Do you have a DataMiner Platinum batch that you spent a lot of time creating that you would like to modify while still keeping the original? Now when you create a new batch, you can select an existing batch that you have already created in the "Template" dropdown. This will make an exact copy of your existing batch that you can tweak to your needs without having to start from scratch. The fields like DonationAmountPriorYear and DonationAmountYTD (year to date) are based on this year end date. Update it by going to Maintenance > Site Setup > Additional Site Options. Watch the help video. Go to Home > User Settings to update your password or email address. Use a strong, unique password for DonorSnap that you are not already using for another website for maximum security. Find your duplicate contacts and clean up your data. Watch the Cleaning Up Your Database Training Webinar. Need a crash course to remind you how to run your contribution statements? Statements can be generated for printing or emailing right from DonorSnap. Watch the Contribution Statements Training Webinar. Donor Fatigue - Fact or Fiction? "Donor fatigue" is when your organization's donors lose interest in your organization over time, and it is accelerated by asking for donations too often. Over time every organization experiences the effect of... Continue reading.